Hello, my name is Carol. I recently discussed my IELTS experience with Andrew from Crown Academy of English and here is the transcript of that discussion. Andrew: Hello Carol. Thanks for doing this interview with Crown Academy of English. Please us a bit about yourself. Carol: Hello Andrew, you’re welcome, I’m very happy to help. My name is Carol, I’m from the Philippines and I am 32 years of age. Andrew: When did you take the IELTS exam? 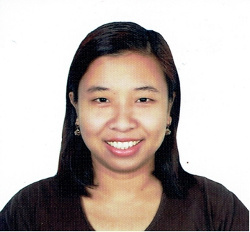 Carol: I took the IELTS exam in November 2013 in Baguio City, Philippines. Andrew: What band did you get? What was your score in each test? Carol: I got 7.5 overall band Score, 8.0 for the Listening, 8.0 for the Reading, 6.5 for the Writing and 7.0 for the Speaking. Andrew: How did you prepare for the IELTS exam? Carol: I spent 1 month in preparing for the IELTS exam and I spent 2 hours each day per week studying for the IELTS. When I prepared, I studied by myself. I photocopied all recent IELTS books and took the tests by myself. I chose a very quiet room and borrowed a timer so I could take the test with the time limit. Aside from this, I asked a teacher to evaluate my writing and speaking tests. This colleague of mine evaluated my writing and speaking using the IELTS marking Schemes and then suggested ways on how to improve my writing and speaking. Also, the academy where I work enrolled me to attend a mock test in a review centre in my city. When I prepared for the listening test, I copied all the MP3 files to my laptop and chose an empty room that I could use without distractions or any noise. Also, I made a copy of the listening answer sheet from the back of Cambridge 9 so I could use that answer sheet when taking my IELTS Listening mock test. After letting a co-worker check my Listening Mock Test, I listen again to the complete test and do the error recovery by myself. It is very important not to read or check the audio script on the back of the book as it will encourage reading instead of listening. For the IELTS reading test, I prepared one set of complete reading every day. Since I had used all the resource materials in the academy where I worked at, I always asked my supervisor to choose the reading tests for me. After all the mock tests in reading is chosen, I took the test for 50 minutes. The remaining 10 minutes would be for transferring all my answers to the answer sheet. After the reading mock test, I checked all my answers and reviewed all the errors that I made and try to understand what went wrong. For the IELTS writing test, I read several strategies for attacking every question type, especially for the first part of the writing test, which is describing the graph based on the information provided. I gathered all types of the writing task 1 questions then did the writing in 15 minutes and 5 minutes for proofreading. This part of the exam is the most challenging, so I practiced 2 writing exercises a day, so that I can be familiar with the different illustrations. On top of that, I studied different expressions necessary for each type of illustration. For the IELTS speaking test, the academy enrolled me in an institution which specializes in IELTS test preparation speaking test. During the mock speaking test, I was recorded. Through this, I could check my mannerisms and evaluate my answers as well. I also asked my Supervisor and teammates to evaluate my speaking skills. The questions used were randomly chosen by my colleagues to avoid bias. Getting speaking practice with an English teacher is essential. Andrew: Please describe how all the tests went. Carol: The listening test did not go well as expected because my seat number was in the back. The sound system was not very good because there was much noise around the building such as buses and cars blowing off their horns, and some students shouting outside. The invigilators had to open the windows at that time because the room was so humid, but it created so much noise. Also, the invigilators could not increase the volume of the speakers because the test takers who are seated in front complained of the loud sound. However, these disturbances did not affect me as I focused and prepared myself to these kinds of occurrences. I still felt confident after the test. For the writing test, I already predicted that for task 1, it would be a process chart, but it was still tough. As for the part 2 of the exam, I got confused. The topic was familiar but because of confusion and exhaustion, I made a very low band score in writing. For the reading test, it went well. I had many practices in reading, so it was very easy for me to finish my reading test. I still had much time to go over my answers and change some of them once I recognised my mistakes. For the speaking test, I was kind of nervous because my interviewer was intimidating at that time. She did not smile or even greet me before the exam, but I still maintained my composure and my calm feeling and answered all the questions confidently. 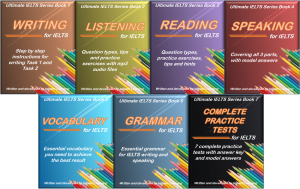 7 IELTS ebooks (800 pages) + audio files to keep forever. Andrew: What advice can you give to my Crown Academy of English students who are preparing for the IELTS exam? Carol: To prepare for the IELTS exam, a student should be equipped with the basic skills in English such as paraphrasing, knowledge in IELTS vocabulary, sentence construction, lexical resource, and summarising. These skills are essential in order to answer the questions in the IELTS exam. Aside from this, as student should be mentally and physically prepared as the test is for almost 3 hours without breaks, so this test would be mentally and physically draining to the student. Also, the student should be very confident and have presence of mind. Most students get nervous, so they cannot think clearly during the test. Lastly, a student should always be very patient in taking mock tests because taking mock tests help students to become more familiar with the different question types and answer the test within the time limit. During the exam, a student should relax and take it easy. You have to check your test papers if you have the correct module for the IELTS exam. Do not hesitate to inform the invigilators regarding the test booklet. Take the official test just as an ordinary test because if a student is nervous, a student cannot think clearly. As a result, a student will leave a lot of blank spaces on his/her answer sheet. Also, do not spend so much time on one question. If the question is tough, go to the next question. If there is enough time left, go back to that question that you had difficulty with. If the question is really tough, make a very wild guess. As much as possible, never leave any spaces blank. Make sure that you had followed all the instructions such as spellings and word limit. Also, make your writing legible so that the examiners can clearly read your answers.